Inspired by the lovely Calla, I was moved to reminisce on a mainstay of a Midwestern upbringing – perhaps it was more widespread than I realize, but any good child of 90s spent a good deal of time plucking away on MECC software during computer class. 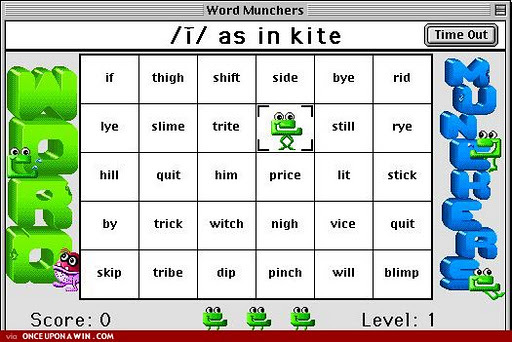 Sure there was Mavis Beacon for those in need of a typing test or two, but the real action was on Word Munchers. Calla speaks of the horrors of Number Munchers, something I managed to avoid through the years, but there was nothing like testing my word and even pop cultural intelligence on my grandma’s old iMac via a frog-looking, slack-jawed hero as he munches his way through “Prime Ministers of the United Kingdom,” “Edible Items,” and “Rhymes with ‘Kite. '” But your foes were formidable. The Troggles were sneaky, portly little fellows with every intention of devouring you whole. If you wanted your chance at throwing on your Superman cape and retrieving letters (while avoiding falling boulders) to get to the top of the Hall of Fame list, you needed to know your famous people… and it didn’t hurt to have Roget’s on hand just in case. But that rascally Minnesota educational consortium didn’t stop there. 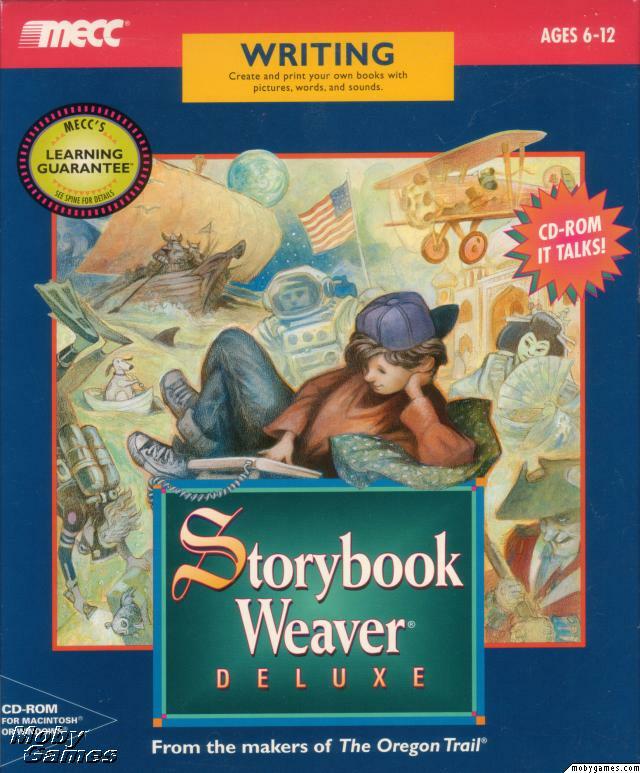 I must say, as a young aspiring writer, I would’ve been nowhere without my Storybook Weaver. Given the opportunity to craft my own novels with full-color, printable pictures (choosing setting, objects, and characters was clearly the most fun part), I found myself drafting my own Animorph short stories and Clue mysteries to fuel my creativity somewhere. Sure, the comically computerized narration option certainly added to its appeal. Though much to the chagrin of many elementary teachers, the poor in-computer voice was talked into saying some colorful words out loud into the ears of fellow classmates in many a computer lab through the years. But rest-assured I was too busy writing serious literature to fiddle with such immature trifles. Yep, I took myself seriously. 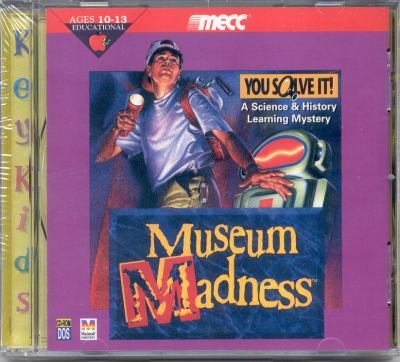 Perhaps my true favorite, though, was Museum Madness. Sure, it wasn’t as popular as the others, but reorganizing a museum that’s malfunctioned by heading through each exhibit and correcting their historical inaccuracies was kind of an ingenious idea. With the help of a trusty (if not often very helpful) robot, and a backpack full of necessary tools, you – as a backwards-cap-wearing ragamuffin – had to help Galileo remember how to discover gravity, help American begin the Industrial Revolution, and assist ancients in realizing the written word by pressing papyrus. Yep, it was pure historically educational glee for a young nerd. Poor Sarah – perhaps my trusty flashlight will shed some light on this situation and rescue you from the stake! The power of magic children. So what did you occupy yourself with in your days in the computer lab? Did you find yourself in the Busy Town of Richard Scarry with your worm friend Lowell? Did you eat the wrong berries and come down with some dysentery on the Oregon Trail? Or would you rather snap photos of giant tarantulas on the Amazon Trail? Hit me up in the comments! THIS IS AWESOME.I feel like I would've done way better with Word Munchers than Number Munchers. I'll take nouns and verbs over factoring and multiplication any day!We definitely did have Storybook Weaver, which I loved. My friend and I used to make little stories of our guidance counselor getting eaten by dragons and things. (We weren't his biggest fans, clearly. )Did you ever play Odell Down Under?! That was my favorite MECC game – you were a fish in the Great Barrier Reef, and you had to make your way up the food chain without getting eaten. It was wonderful.